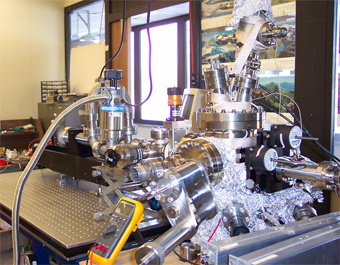 This chamber is an ultrahigh vacuum tribology apparatus for carrying out friction experiments under well-controlled conditions. 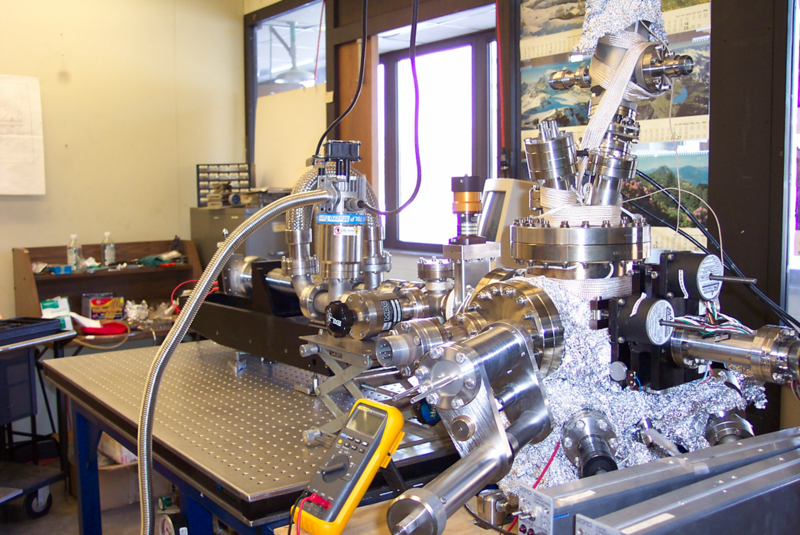 The sample is mounted to a sample manipulator, which is oriented horizontally and on the opposite side of the chamber to the tribometer. A tribo-pin can then be brought into contact with the sample and the tribological properties measured. The tribo-arm can be moved in the x, y and z-directions using servo motors where the motion is coupled using bellows to make it ultrahigh vacuum compatible. The loads normal and tangential to the sample are measured by means of strain gauges attached to narrowed portions of the tribo-arm where the normal load can be varied between 0 and 0.2 kgm (0 to 1.96 N). The sliding velocity can be varied between ~0.02 and ~10 mm/s and the apparatus is under computer control. In a typical experiment, the normal load, scan speed, scan area and scan pattern are selected. Various scan patterns are available including a singe pass in each direction, a zigzag pattern or a reciprocating scan over the same region.